182 MMS November 2017 mmsonline.com MODERN EQUIPMENT REVIEW difficult materials without interruption or strain. An optional speed package enables accel- eration of up to 10 m/s² and speeds of up to 90 m per min., reducing chip-to-chip times by approx- imately 10 percent, the company says. Heller Machine Tools, call 248-288-5000 or visit heller-us.com. HIGH-PRESSURE COOLANT SYSTEMS TAILORED TO DIFFERING ENVIRONMENTS Four high-pressure coolant systems from CNC Indexing & Feeding Technologies are engineered for the production and economic requirements of differing manufacturing environments. The HPC-400 is ideal for lathe and ver tical m ill a p p li c ati o ns. T h e syste m's 8 - g p m g e a r pu m p fo r wate r- based coolant is a d j u s t a b l e f r o m 7 5 t o 4 2 7 p s i , a n d a n o n b o a rd transfer pump is standard. The HPC-1000 s y s t e m o f f e r s versatility in appli- c ati o n s o n h o r i - zontal and vertical milling machines as well as lathes, and can be used in conjunction w i t h o t h e r m a n u f a c t u r i n g e q u i p m e n t. T h e sys te m's 8 - g p m, 7.5 -h p g e a r p u m p sys te m for oil- and water-based coolant is adjustable f r o m 75 to 1,0 0 0 p s i. A n o n b o a r d t r a n s f e r pump, 37-gal. reservoir tank and four port outlets are standard. The HPC-1500 coolant system achieves higher flow rates needed for tools with large coolant orifices. The system's 8-gpm, 7.5-hp gear pump accommodates oil- and water-based coolant and is adjustable from 75 to 1,500 psi. The unit features an onboard transfer pump, 37-gallon reservoir tank and four port outlets. 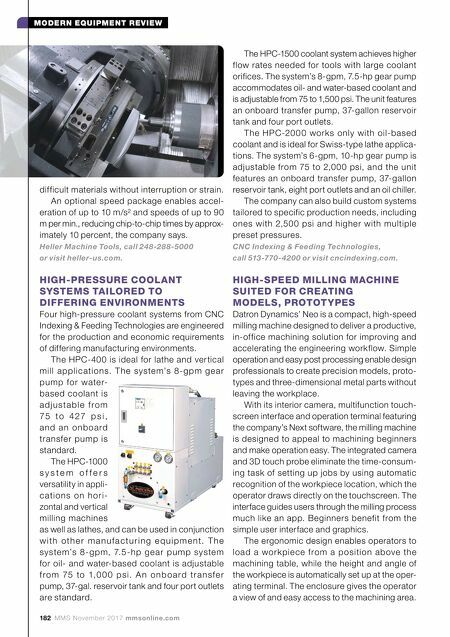 The HPC-20 0 0 works only with oil-based coolant and is ideal for Swiss-type lathe applica- tions. The system's 6-gpm, 10-hp gear pump is adjustable from 75 to 2,000 psi, and the unit features an onboard transfer pump, 37-gallon reservoir tank, eight port outlets and an oil chiller. The company can also build custom systems tailored to specific production needs, including ones with 2,500 psi and higher with multiple preset pressures. CNC Indexing & Feeding Technologies, call 513-770-4200 or visit cncindexing.com. 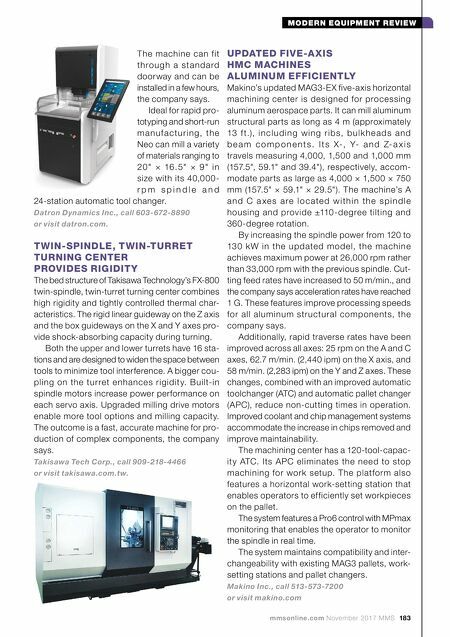 HIGH-SPEED MILLING MACHINE SUITED FOR CREATING MODELS, PROTOTYPES Datron Dynamics' Neo is a compact, high-speed milling machine designed to deliver a productive, in-office machining solution for improving and accelerating the engineering workflow. Simple operation and easy post processing enable design professionals to create precision models, proto- types and three-dimensional metal parts without leaving the workplace. With its interior camera, multifunction touch- screen interface and operation terminal featuring the company's Next software, the milling machine is designed to appeal to machining beginners and make operation easy. The integrated camera and 3D touch probe eliminate the time-consum- ing task of setting up jobs by using automatic recognition of the workpiece location, which the operator draws directly on the touchscreen. The interface guides users through the milling process much like an app. Beginners benefit from the simple user interface and graphics. The ergonomic design enables operators to load a wor k pie ce from a position above the machining table, while the height and angle of the workpiece is automatically set up at the oper- ating terminal. The enclosure gives the operator a view of and easy access to the machining area.